All the ultimate performance of a digital SLR without the size and weight. Combine a 5x wide-angle zoom, high ISO and optical image stabilisation and you get a serious bit of kit for the money. Captures RAW images for those who love image manipulation afterwards. This 14.7 megapixel model also has a 3-inch LCD screen, optical viewfinder and 26 shooting modes including full manual mode for total creative control. A 14.7 megapixel sensor provides rich detail for large-scale prints and creative cropping, while allowing you to make the most of the camera’s Safety Zoom and Digital Tele-Converter functions. Capture more in your frame with a compact, high quality 5x wide-angle (28mm, f/2.8) lens. Canon’s optical Image Stabilizer technology counteracts the effects of camera shake, for crisp, blur-free images throughout the zoom range. RAW shooting gives complete control over all image parameters in post-shoot editing. 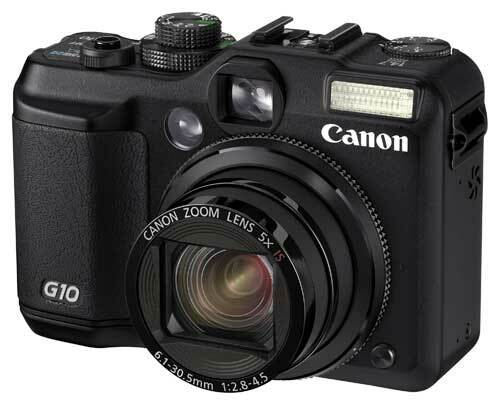 Support for Canon’s Digital Photo Professional (DPP) software allows Digital SLR users to integrate the PowerShot G10 into their workflow. The latest in image processing technology, DIGIC 4 delivers extraordinary noise reduction. The result is richly detailed, cleaner images, even at high ISO speeds. DIGIC 4 also drives exceptional processing speeds and responsive operation. The PowerShot G10 combats blur with High ISO Auto and Motion Detection Technology, which ascertains movement of both camera and subject to set the optimum ISO, whatever the shooting situation. Servo AF tracks moving subjects to ensure they remain in focus. For easy, spontaneous portraiture the PowerShot G10 uses Canon’s Face Detection AF/AE/FE/WB. Face Select & Track optimises settings for a chosen person, while FaceSelf-Timer is ideal for self-portraits or group photos. The 3-inch PureColor LCD II has outstanding resolution (460K pixels) for exceptional detail during framing or playback - while an optical viewfinder offers extra framing choice. Dedicated Exposure Compensation and ISO dials provide convenient adjustment of exposure and ISO without the need to access menus. A Multi Control Dial provides fast, accurate access to menu items, functions and images. i-Contrast analyses a scene during shooting or playback, then boosts brightness in dark areas. The result is improved contrast with detail retained in tricky lighting conditions. 26 modes, including numerous automatic modes, make shooting in tricky situations easier. The PowerShot G10 also offers full manual mode, for total creative control.